The Samsung Galaxy Gear smartwatch is not a bad product at all but its still basically an unfinished one and when Samsung announced the Galaxy Gear there were rumors floating around that the Galaxy Gear 2 will be announced early next year and well that rumor might turn out to be true if another rumor is to be believed which says the Galaxy Gear 2 will be announced at MWC 2014. 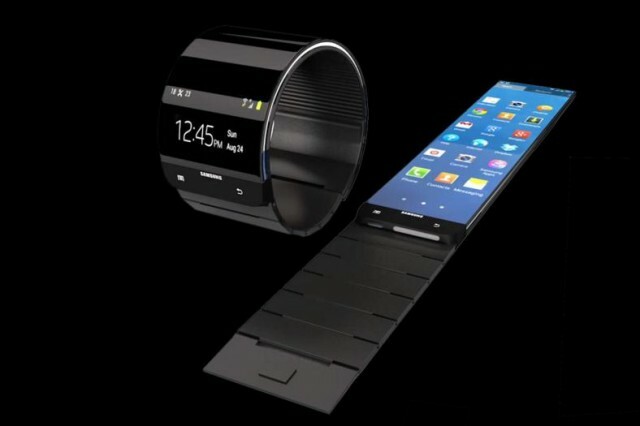 Samsung Galaxy Gear 2 might look like this as a Samsung patent application suggests. The report comes from The Korea Herald whose sources say “it’s a high possibility” that we might see the Galaxy Gear 2 getting unveiled at MWC. What do we know about the Galaxy Gear 2? Well not much except for the fact that it will feature a flexible display. Then there’s another device dubbed Galaxy Band which is said to make its way along with the Galaxy Gear 2. It is said to be a health and fitness tracker such as the likes of Nike FuelBand or FitBit. Wearable tech or smartwatches are surely the new big thing in the industry today with Qualcomm, Samsung, Sony already trying their hand at it while there are rumors that LG is working on one and not only LG but Google and even Nokia might be working on one and then there’s also the rumored Apple iWatch. That is all we know but reports suggest they are surely coming early next year so if you are planning on getting a Galaxy Gear, we would suggest to hold your plans and wait for a couple of more months.